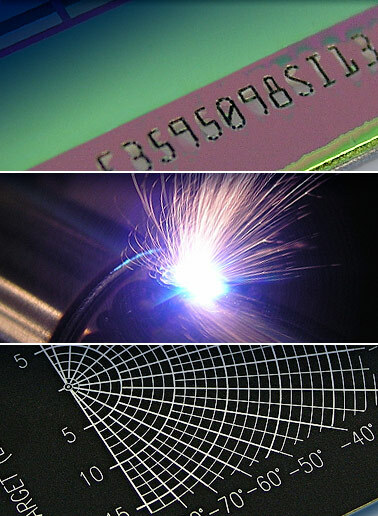 Electronic Components: From serializing silicon wafers to laser services for engraving metal and plastic packaging for microelectronic circuits, Laser Impressions offers a comprehensive list of laser services for the electronics industry. Medical Instruments: Laser Impressions Inc. engraving process is approved by the FDA so medical instrument and medical component manufacturers have one less hurdle in the product approval process. The medical laser engraving process is permanent on metal surfaces like titanium and stainless steel. Delrin, Teflon, PEEK, Ceramic and ABS are examples of medical grade plastics that are commonly marked by the laser engraving process. Industrial Components: For industrial applications, laser engraving is the preferred part marking method, offering permanent laser engraving, laser etching and laser marking on a wide array of materials. Laser Impressions has the ability to laser engrave large hard to handle components as well as laser etch small parts & complex shapes. Promotional Items: Laser Impressions’ laser engraving services allows personalization and custom engraving of a wide spectrum of personalized promotional items. Engraved Bricks: Laser engraved bricks provide an easy and cost-effective avenue for fundraising, donor recognition, personalized bricks, company logo bricks or brick campaigns.